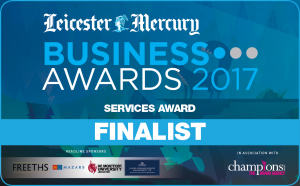 Congratulations to Checkprint Ltd, a member of The TALL Group of Companies, on the fantastic news that Checkprint Limited has been shortlisted as a finalist for the “Services Award” at this year’s Leicester Mercury Business Awards. The team look forward to attending the Awards Dinner on the 27th April at the Leicester Arena to see who will be category winner. The award nomination comes on the back of news that the TALL Group of Companies, the UK leader in the provision of secure paper and payment solutions, has enjoyed its most successful year to date after achieving a record sales turnover for 2016. The organisation secured a pre-audit group sales figure of £14.6 million, representing a rise of 24% on the previous year, including above target sales at the Hinckley-based Checkprint.